On our way south to Grenada, Mark and I only spent about a week in Martinique, stopping in the capital Fort-de-France and its surroundings and in Grand Anse d’Artlet, not being impressed with the country. The beaches we saw were fair, with “Dogs Prohibited” signs all over them. Luckily, few Caribbean “rules” are enforced and nobody yelled at us. On the other hand, Martinique’s check-in procedures are very quick, easy and free and bringing Darwin into the country is not a problem at all. You got to love the French islands for that. The forms don’t even have a box to check for pets. 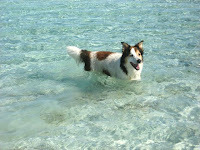 We are training Darwin every day to be left alone again, starting slowly with 15 minutes, up to 30 minutes in Martinique. During one of those sessions, we scoped out the Leader Price, a favorite grocery store amongst cruisers, because of its reasonably priced French goods. I went back later to load up our fridge and cabinets with cheeses, salami, smoked salmon, pâtés, snacks and affordable European milk and granola. A couple of nights in a row we splurged on these things with fresh baguettes. Mmmmm…. One day we managed to finish two big boat projects that had been hanging over our heads for months, which created a feeling of satisfaction and achievement. I finally decided to do one load of laundry in a real washing machine, because this was needed for a while. Just the washing cost us the equivalent of US $ 10, which is why I do most of it by hand when we have enough (rain) water. The hot water (precious to come by in machines around here) made it worthwhile, this time! 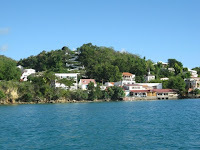 From Le Marin, we moved Irie a bit down the bay, to the cute looking town of Ste. Anne, where we spent a few days. The clear water, nice views and proximity of a good bakery made this place attractive to us, even though Darwin was looked at with fear and annoyance a few times. We ignored the “No Dogs” signs, but felt awkward walking him on the beach. The biggest draw in this area are the southern beaches. We learned about a 3 mile trail to Salines Beach, the prettiest one in Martinique, and one day, we set out exploring with Darwin. First we had to walk through town and along a hot road for a mile or so, but the hike itself was a wonderful retreat in shaded forests, following an attractive coast, through mangroves and along white sand beaches. We stopped at one of these along the way to cool off, being the only people around. Martinique has many well marked trails and this one runs all along the south coast and up some. It is called “Trace des Caps”. In Salines, there are food stands and cold drinks for sale. 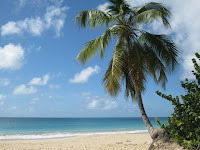 The beach is long and quite pretty, backed by greenery and palm trees. No development to be seen and lots of vacationers and families were enjoying the cool, clear water. We hung out for a bit, before making the walk back to Ste. Anne and the dinghy. For a long time, we were going back and forth about what to do over Christmas. Some people we knew from Grenada were going to have a beach picnic with tasty finger food and that sure sounded good. But, a north swell would be running for a long time to come and we really didn’t want to get stuck in Martinique for weeks because of the weather. 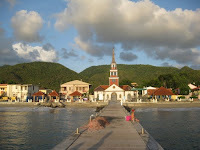 We played with the idea to visit St. Pierre in the northern part of Martinique and Roseau in the southern part of Dominica on days with little swell, since these anchorage are quite open to the sea. 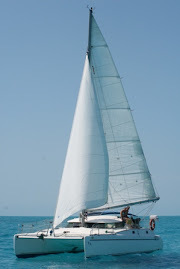 Swell less days would be far and few between, so we did decide to give it a try and left Ste. Anne on the day before Christmas, mostly because there was no good (read: cheap or free) WiFi there. 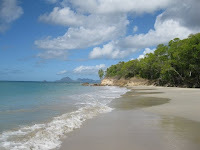 We spent one night in Grand Anse d’Arlet (with great internet), where we took Darwin for a walk to picturesque Petit Anse ‘dArlet, before arriving in St. Pierre. We didn’t have to worry about the north swell in St. Pierre. There was none; instead a big swell from the south (because of the rare southeast winds) rolled in, making the place pretty uncomfortable. 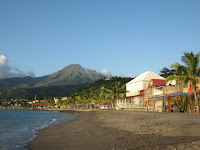 Since it was Christmas Day, the whole town was dead and we were left rocking on Irie with gorgeous views of the volcano (Mt. Pelée) and a simple meal. A quiet one for us, this year. 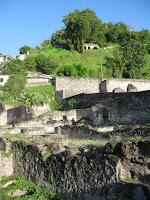 The next day, the three of us visited the center of St. Pierre, once completely ruined by the volcano eruption of 1902. Scattered around, you see remnants of this disaster, which killed all but two residents. Old walls are integrated with the rebuilt town and some ruins still exist, like the theatre ruins and the prison cell. This cell saved one prisoner in 1902 because of its thick walls. The clear weather treated us with marvelous cloud free views of the volcano all day long. I couldn’t get enough of photographing this majestic mountain. On this day after Christmas, we also remembered Kali. We still think and talk about her a lot, but exactly one year ago she passed away and that day we lost something very important to us and our lives. A candle was lit all day, we looked at pictures, recalled stories and reread my incredibly sad diary entry from December 26th 2008. 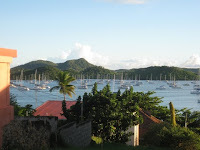 The following day, we left for Dominica.